PSA Goals: 1. To let drivers know that school busses are now equipped with video cameras to catch drivers who illegally pass a stopped school bus. 2. To increase awareness about laws prohibiting drivers from passing stopped school busses when the school stop sign arm is engaged. Please download and air, broadcast or webcast any and all of these public service announcements. You may also put these spots on your web page and in any other social media venues, communications to parents and the general public. These spots may be played back as part of any live event. These spots are available to use immediately in all jurisdictions throughout Maryland and the United States of America, with the intent of increasing awareness about the school bus law, enforcement by video cameras, as well as fostering greater school bus safety. There is no kill date. 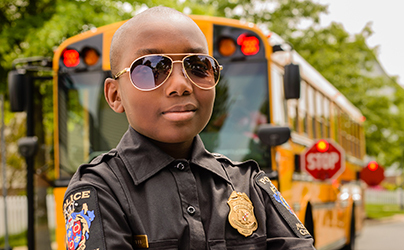 The production of this public service announcement is a joint partnership between Montgomery County Public Schools(MCPS), MCPS-TV, the Montgomery County Police Department and Montgomery County Government.